Western Illinois University students, faculty and staff gathered along University Drive, Q-Lot and Tanner Hall to host the first Rally for Love on Saturday, Nov. 17. Western Illinois University and its LGBTQIA+ community held its first Rally for Love on Nov. 17. 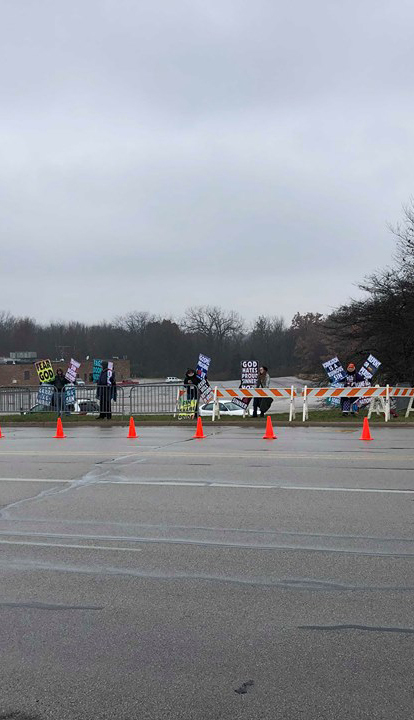 In response to a planned protest from the Kansas based Westboro Baptist Church, Macomb community members and Western Illinois faculty planned the Rally for Love to be held on the same day. With Saturday being the first day of fall break, the turnout for the Rally for Love was not expected to be very high. Along with the beginning of break, the weather forecast was bleak with temperatures expected in the low 20s to mid 30s with expected rain and snow. When the day came, the student and communityturnout exceeded expectations for event organizer Chase DeWitt. One member of the student population that stood out in the crowd was Jordan Davidson. Davidson was dressed in rainbow suit, blue shirt and rainbow tie. Davidson walked through the crowd of Q-Lot with a smile on his face. He was stopped multiple times by fellow community members asking for photos. Jordan Davidson found his suit online when he was searching for pride wear. Like some other members of the community, Davidson was surprised when he heard that Westboro was coming to Western’s campus. Westboro Baptist Church sent five members of their community and they set up at the intersection of Lafayette Street and University Drive. Fences, traffic cones, construction barriers and Macomb police officers protected members of the church. Across the street stood around 40 to 50 counter protestors. The counter protesters held signs and played music from their cars. Songs like “Dancing Queen” by ABBA and “We Are the Champions” by Queen blared out of a white Ford Sudan with Colorado license plates. Dewitt saw the event as an extreme success and was thankful for all the support that was shown from those who attended the event. He was overcome with emotion as he watched the event take place. “Ecstatic, exceedingly ecstatic. I think it’s the same sentiment from a lot of my staff here. They are very excited that the community has shown so much support here. You can see how many posters were handmade. Specifically I do want to thank the organizations that have helped us out.” Businesses from around Macomb offered various goods and services in support of the event. McAllister’s and Wal-Mart provided food and beverages for musicians, community members gave donations for shirts and stickers, Western provided the estate for Q-Lot and the young business members of Macomb helped organize the event.